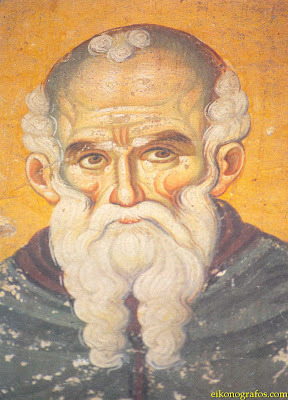 Athanasius was born in Trebizond of God-fearing parents. He became orphaned at an early age but, by the Providence of God, a commander took him under his care and brought him to Constantinople to be educated. Because of his meekness and humbleness, he was the favorite of his peers. During the children's games, the children chose one to be an emperor, one a commander and Athanasius as abbot as though it was some kind of foretelling! 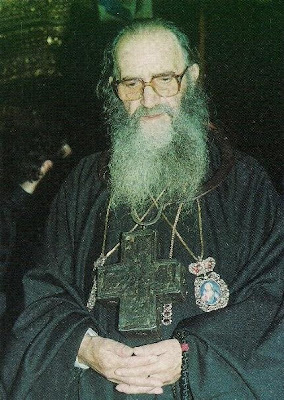 Having completed his education, Athanasius (who before tonsuring was called Abraham) withdrew into the desert of Maleinos near Athos, the Holy Mountain, where he lived the life of an ascetic as a disciple of the then renowned Michael Maleinos. Desiring a more difficult life of mortification, Athanasius settled on Holy Mt. Athos to live in silence (the life of a silentary). But many who were desirous of a life of asceticism began to gather around him and, therefore, he was compelled to build his famous Lavra [monastery]. In that, he was assisted by the Byzantine emperors: at first, Nicephorus Phocas, who himself thought to withdraw and to become a monk and, after him, John Tzimiskes. Countless temptations befell Athanasius both from demons and from men but he, as a brave soldier of Christ, resisted and conquered all by his immeasurable meekness and continual prayer to the Living God. 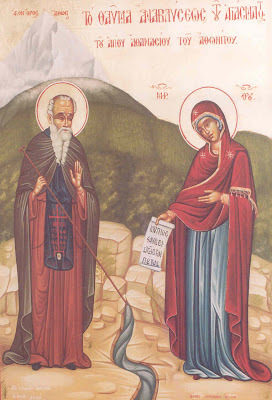 Filled with the Grace of God, Athanasius was made worthy to see the All-holy Birth-giver of God who miraculously brought forth water from a rock and promised that she would also be the abbess [Ikonomisa, the one in charge of the provisions of the monastery]. In work and in prayer, Athanasius surpassed his brethren and loved all with the love a spiritual father and shepherd. Death came to Athanasius unexpectedly. At one time, he with six other monks, climbed upon a newly built vestibule of the church to inspect the wall which was being constructed and the wall caved in on them and buried them. Thus, this great beacon of monasticism died in the year 980 A.D. Many times following his death Athanasius appeared to his brethren either to comfort them or to reprimand them." 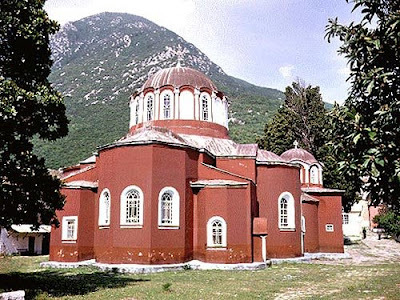 "The Holy Monastery of Megiste Lavra is on the south-eastern side of the Athos peninsula at a place called Melana, an area where fragments of monuments which take us back to the pre-Christian era are to be found. With the permission of the Emperor Romanus II, Athanasius began building works. Soon afterwards, his friend Nicephorus Phocas became Emperor and supported him in a variety of ways. The katholikon was built first; very soon large numbers of many nations and languages, some distinguished and others totally undistinguished, flocked to lead the monastic life under the direction of the Saint. The policy of support of Phocas was continued by his successors Tsimiskes and Basil II (nicknamed) the Bulgar-slayer, in spite of opposition to St Athanasius in some quarters. Among the many priceless treasures of the Monastery is the icon of Our Lady Koukouzelissa, patriarchal and imperial dalmatics, and sacred relics. The library of the Lavra has some 2,116 manuscripts, 20,000 printed books, and about 100 manuscripts in foreign languages. 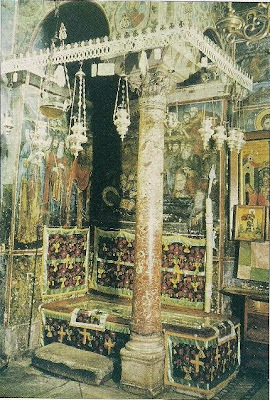 The three famous Sketes of St John the Baptist, St Anne (Aghia Anna), and Kafsakalyvia, the groups of kalyves of Mikra Aghia Anna, Katounakia, Karoulia, Kerasia, and others, the famous kellia of Mylopotamos, St Nilus, and the ascetics' retreats of Sts Peter the Athonite, Athanasius, and Nilus are all possessions of the Lavra. The historic Kellia of Provata and Karyes also belong to it. In 1963, the Megiste Lavra, together with the whole of the Holy Mountain, celebrated its thousandth anniversary. In 1980, the Monastery returned to the coenobitic system, and today it has some 50 monks living in the Monastery and around 300 in its dependencies." See here more information about two wonderworking icons of Panagia (Oikonomissa and Koukkouzelissa) at Megiste Lavra. The Angels' ranks were awed by thy life in the flesh, how, though corporeal, and clad with earthly clay, thou didst set forth with courage to invisible wars and wrestlings and didst boldly smite the hordes of the demons with mortal wounds. Wherefore, Christ rewarded thee with abundant gifts in return. Entreat Him that our souls find salvation, O most renowned Father Athanasius. The yoke of thy Christ, thou tookest on thyself with faith, while bearing thy cross upon thy shoulders as a true and unrivalled emulator of His dread Passion and sharer of His great glory, partaking of divine and unending joy, O Athanasius.